How does a world come together? How does a world fall apart? Neoliberalism made these questions into one – and September 11 showed that there can be no perfect synthesis. In the twenty-first century the continents have gone adrift. Here is where the maps of a new “great game” unfold, for activists and also for researchers. 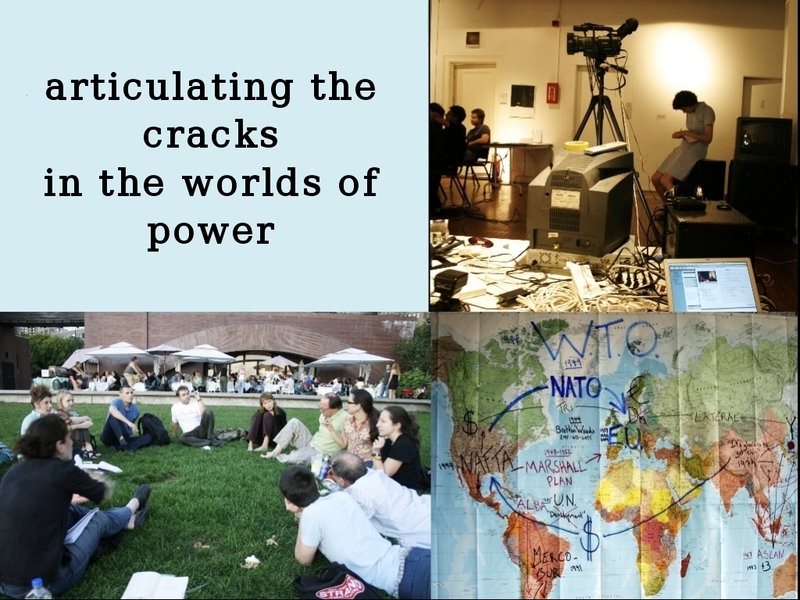 Locating yourself against the horizons of disaster, then finding the modes and scales of concrete intervention into lived experience, are the pathways for grassroots intellectual action in the contemporary world-system. A double dynamic is at work today, which destroys what it constructs, dissolves what it unifies. And that is exactly what we all have to deal with. One example is the continuous enlargement of the European Union since the collapse of the Eastern bloc in 1989, right up to the fiasco of the ultraliberal constitution, proposed by continental elites and rejected by popular referenda in 2005. The end of the historic split with the East now appears as the beginning of a Core Europe/New Europe divide, with the social-democratic bastions of the West seeking shelter from the global market, while post-Communist states refuse any speed limits on their road to riches. The backlash against Europe has largely been the work of traditional sovereignists, with leftist forces wavering between their national and internationalist ideals. But the absence of a fully democratic constitution only favors corporate lobbies and big-power deals, leaving yesterday’s parliaments as a smokescreen over tomorrow’s real decisions. An even more striking case is the self-eclipsing rise of the WTO, which in the 1990s seemed fated for the role of a depoliticized World Government. No sooner was the international trading regime consolidated than tariff wars sprang up between the US and the EU, protests flared around the globe and the process of bloc formation gathered steam, with negotiations for both the Free Trade Area of the Americas (FTAA) and a renewed Mercosur in the Southern Cone, plus bold new moves toward an expanded ASEAN system (joined by China, Japan and South Korea). And don’t forget the Venezuelan proposal of ALBA, or Alternativa Bolivariana para las Americas, calling for a leftist “dawn” in Latin America after the sundown of Yankee-style free trade. Today the FTAA has already failed, while North America’s NAFTA has been strengthened by the so-called Security and Prosperity Partnership of 2005 and the East Asian system has continued its inexorable climb toward economic hegemony. But the international monetary crisis continually looms; and as any historian remembers, trading-bloc formation after the collapse of the gold standard was a prelude to the global conflicts of the 1940s. For the strangest embrace of contradictory forces in the world today, consider the symbiotic tie between industrialized China and the financialized United States. China constantly struggles to produce what the US constantly struggles to consume – at an ecological risk that no one can even measure. To make the wheel of fortune go on spinning, the Chinese lend their manufacturing profits back to the US, so as to prop up speculation on the almighty dollar and keep the world’s largest market soluble. Every economic crisis makes this equation more uncertain: and over the last decade we’ve been seeing more and more of them. What will happen if the Chinese pipeline to the US Treasury stops flowing is anybody’s guess; but America’s attempts to save its fading hegemony have already begun to look desperate, ever since the New Orleans floodwaters receded into a domestic quagmire that clearly recalled the international disaster in Iraq. A new period of systemic upheaval could already be upon us. Levels of conflict are rising all across the globe, and the problem of how to intervene as a world citizen becomes more complex and daunting than ever. The counter-globalization movements marked the first attempt at a widespread, meshworked response to the chaos of the post-’89 world system. These movements were an uneasy mix between democratic sovereignists, no-border libertarians (David Graeber’s “new anarchists”) and traditional, union-oriented Keynesians. They could all critique the failures of neoliberal governance, but they all diverged and faltered before its cultural consequences. And the latter wasted no time in coming. By undercutting social solidarities and destroying ecological equilibriums, the neoliberal program of accelerated capital expansion immediately spawned its neoconservative shadow in the form of a military, moral and religious return to order. Nothing could have made better cover for the denial of democratic critique, the clampdown on civil liberties and the continuing budgetary shift from social welfare to corporate security. The backlash against globalization became a powerful new tool of manipulation, used by the same elites who launched the whole process in the first place. The current scramble to consolidate regional blocs reflects the search for a compromise between global reach and territorial stability. Beyond any “clash of civilizations,” finding a feasible scale for contemporary social relations has now become a pressing question. From this perspective, the free-market policy of the Bush administration in Latin America is comparable to Al Qaeda’s dream of an Islamic Caliphate in the Middle East: both want to impose a single ideology for political and economic ends. The networked production system forming around Japan and China, or the EU’s continuous diplomatic courtship of Russia despite flagrant atrocities in Chechnya, give similar insights into this quest for a workable scale, which is essentially that of a “continent,” however elastic or imprecise the term may be. Paradoxically, continentalization is not countered but is driven ahead by global unification. Behind the tectonic shifts at the turn of the millennium lies the accumulated violence of a thirty-year neoliberal push toward a borderless world, wide open to the biggest and most predatory corporations. The extraordinary breadth and speed of the current metamorphosis – a veritable phase-change in the world system – leaves progressive leftist activists facing a double challenge, or a double opportunity. They must remap the cultural and political parameters that have been transformed by the neoconservative veneer, while remaining keenly aware of the neoliberal principles that remain active beneath the surface. In this effort the social sciences are the key, whenever it’s possible to emancipate them from their illusory neutrality. Economic geography is crucial for tracing the global division of labor and grasping the wider frameworks of what European activists call “precarity.” The sociology of organizations reveals who is in control, how power is distributed and maintained in a chaotic world. The study of technics charts out the future in advance, to show how it operates and on whom. And the toolkits of social psychology offer insights into the structures of willful blindness and confused consent that uphold the reigning hegemonies. This kind of analysis is critically important for activist initiatives, which can stumble all too easily into the programmed dead-ends of manipulated ideologies. Yet the disciplines also have to be overcome, dissolved into experimentation. Autonomous inquiry demands a rupture from the dominant cartographies. Both compass and coordinates must be reinvented if you really want to transform the dynamics of a changing world-system. Only by disorienting the self and uprooting epistemic certainties could anyone hope to inject a positive difference into the unconscious dynamics of the geopolitical order. How could activist-researchers move to disorient the reigning maps, to transform the dominant cartographies, without falling into the never-never lands of aesthetic extrapolation? The solution is inseparable from its embodiment, from its social elaboration. Just try this experiment in public presence: literally tracing out the flows of capital, the currents of warfare and the rise and fall of transnational organizations since 1945, using hand-drawn dates and arrows on a conventional Mercator projection. The effect is to build a cartographic frame-narrative of the emergence, complexification and crisis of US hegemony since 1945; but at the same time, through gesture and movement, to act out the ways that geopolitical flows traverse living bodies and become part of haptic consciousness, entering what some of us have called “felt public space.” Intellectual work becomes intensive when it is unmoored from normalizing frameworks, acted out as a social experiment in a self-organized seminar, in a squat or an occupied building, at a counter-summit, on a train hurtling through Siberia… As supranational regions engulf ever-larger populations and the passage of shifting borders becomes an ever-more common activity, geopolitics is increasingly experienced in the flesh and in the imaginary, it is traced out on the collective skin. This is when geopoetics becomes a vital activity, a promise of liberation. How to interpret artworks and artistic-activist interventions so as to highlight the forms taken by the geopoetic imaginary? Through analytical work on the dynamics of form and the efficacy of symbolic ruptures, one can try to approach the diagrammatic level where the cartography of sensation is reconfigured through experiment. This level comes constantly into play whenever it is a matter of moving through analysis back into intervention. Because of the transverse nature of global flows, it is possible to draw on the experiences of faraway acts of resistance in the midst of one’s own confrontations with power, both in its brute objective forms, and in its subtle interiorizations. The network of inspiration between the pot-banging cacerolazos of the Argentinean insurrection in 2001 and the almost continuous urban mobilizations in Spain, from February 15, 2003, all the way up to the ouster of the mendacious and power hungry Aznar government in March 2004, is a large-scale example of this process of transduction. This is the generative side of the contemporary continental drift. To sense the dynamics of resistance and creation across the interlinked world space is to start taking part in the solidarities and modes of cooperation that have been emerging across the planet since the late 1990s. If you want to accomplish anything like this kind of research, don’t expect much assistance from the existing institutions. Most are still busy adapting to the dictates of neoliberal management; and the best we could achieve during the first big round of meshworked critique was to hijack a few of their people, to divert a few of their resources. What’s more, the open windows that do subsist are likely to close with any further hardening of the neocon turn. Self-organized groups will have to generate a collective learning process about the effects of social atomization and economic subjugation – essentially, a new understanding of the forms of contemporary alienation – and they will have to explore the reactions to those trends, whether intensely negative (the fascist and racist closure of formerly democratic societies) or positive and forward-looking (activist interventions, the invention of new modes of social self-management, cultural reorientations, ecologically viable forms of development). Another goal of the critique is to raise the level of debate and engagement in the cultural and artistic sectors – the vital media of social expression – where a narcissistic blindness to the violence of current conditions is still the norm. Yet a further realm that urgently needs exploration is the matrix of interlinguistic exchange and the crisscrossing vectors of translation, beyond the common currency of imperial English. Other possible worlds will only be articulated by a multitude of tongues, speaking the relations of the scales in their own words and in the words of strangers: intimate, urban, national, continental, global, all overspilling their idiosyncratic dictions. Geopoetics is the revelry of Babel. Still the most important aim, for me anyway, is to help relaunch the grassroots mobilizations that were so promising around the turn of the millennium. “Help” is the word here, because there is no intellectual privilege in the activist domain. Activist-researchers can contribute to a short, middle and long-term analysis of the crisis by examining and inventing new modes of intervention at the micropolitical scales where even the largest social movements begin. Who can play this great game? Whoever is able to join or form a meshwork of independent researchers. What are the pieces, the territories, the wagers and rules? Whichever ones your group finds most productive and contagious. How does the game continue when the ball goes out of your field or domain? Through shared meetings in a meshwork of meshworks, through collective actions, positions, projects and publications. And most importantly, who wins? Whoever can provoke some effective resistance to the downward spiral of human coexistence at the outset of the twenty-first century. This entry was posted on March 17, 2008 at 9:07 pm and is filed under 1. You can follow any responses to this entry through the RSS 2.0 feed. You can leave a response, or trackback from your own site.